Santoni and Rubelli continue their artistic collaboration. Although representing different worlds, both companies represent the quality of the «Made in Italy», items renowned all over the world. The Venetian brand Rubelli has been associated with unique fabrics and exceptional high-end production since the end of the XIXth century. Santoni’s history begins more recently, in 1975, when the company from the Marche region embarked on a path focused on craftsmanship, use of top qualitymaterials and meticulous attention to detail. Proving itself successful from the very beginning, this formula has led Santoni to become a solid establishment recognized internationally. Rubelli’s fabric meets Santoni’s feminine shoes. The result is a collection of pumps and slippers featuring the famous «Queen Anne» fabric, one of the oldest and most appreciated creations of Rubelli. 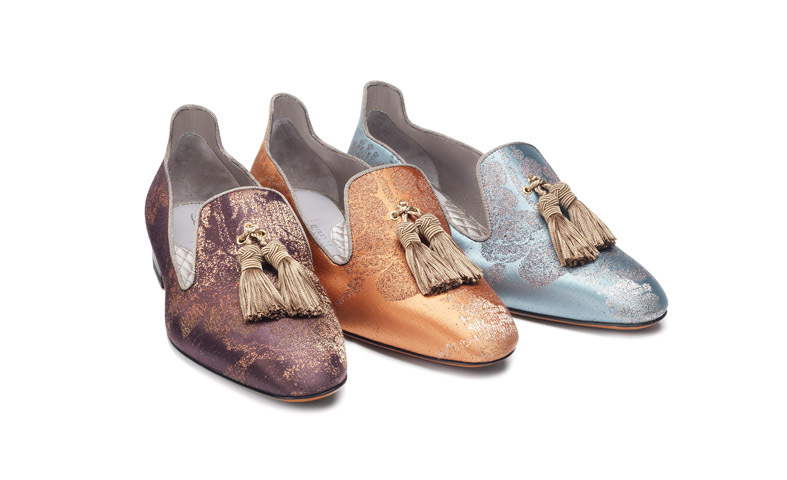 A selection of flat slippers enhanced by leather tassels and created using the extraordinary Rubelli, fabric featuring floral tone on tone decorations. Stiletto pumps pay homage to the Baroque spirit of the Venetian brand and the result is unexpected; the never-ending play of contrasts proves once again to be the winning approach. This limited edition collection, created to celebrate the Christmas Holidays, is now available on Santoni’s online boutique.